It is rare to be able to sit with one’s significant other, sharing an experience of a meal over several hours, enjoying one’s company while also enjoying the finest cuisine in a romantic atmosphere. Such is an experience that tends to escape most of us. We view our dining in different ways, sure, but more and more we view the dining experience as one of haste and rush rather than relaxation and enjoyment. 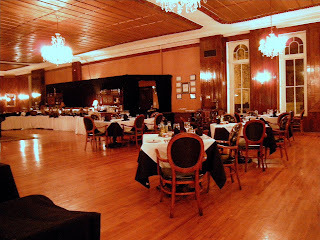 Those feasters of old and their Renaissance tables laden with food and entertainment may (for the modern world) be past, but the ideas of Victorian splendor are still very much alive at the 1886 Crystal Dining Room at the 1886 Crescent Hotel in Eureka Springs, Arkansas. 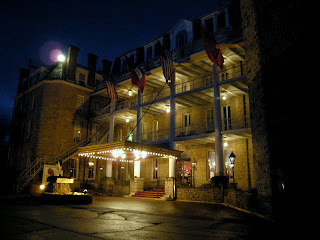 I could write for days about the hotel that houses the restaurant -- on its historic value, on its world-class spa, on the haunting spectres seen by guests, on its lush hilltop grounds. To do so would be to mute out the grand experience I enjoyed with my husband on a blustery March evening. Such reminiscing will have to wait until later. The wind was spitting a little mist into the air when we arrived. Clouds threatened the darkening sky. We ducked into the red-clad lobby and gathered our bearings before entering the richly paneled Crystal Dining Room on the north side of the hotel. The room swept out before us, a great expanse of black and white linen-topped tables on a lovingly polished wood floor. Each tabletop was decked with a collection of fine crystal wine glasses, a sweetener service set, decanters of olive oil and vinegar, salt and pepper, French sea salt and two volcanic salts. On this Wednesday evening, the room was also bereft of diners. Our kind host, Aaron Bazon, came out to greet us. 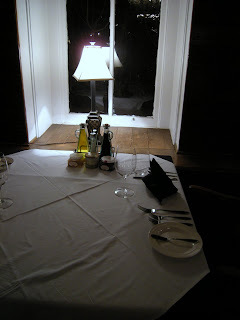 He directed us to a table in the corner of the room, next to a window overlooking the back patio of the building. He shared with us details about the restaurant, welcoming us on our first visit. The lightning played outside the window as soft jazz echoed through the room. We ordered beverages, red wine for my husband, iced tea for me. Aaron left us alone with our menus, and we spent quite some time shuffling through the selections. The price structure at the Crystal Dining Room is different from your average restaurant. Only the entrées come with prices. That’s because each meal at the Crystal Dining Room is meant to be an experience. 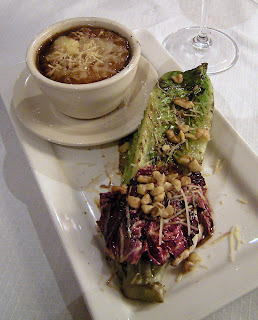 It’s a coursed dinner featuring bread, a soup and salad, an appetizer, the entrée and dessert. We labored over the selection of each item for some time. After we ordered, Aaron shared with us tales of the week. Earlier on, the room had been filled with attendees of the Governor’s Conference on Tourism, packed wall-to-wall with visitors enjoying different set-up stations of goodness, from salads and soups to cook-to-order entrées. I could imagine how the room must have looked, packed to the gills with people. Our bread course arrived. Bread here is not looked at as an afterthought; it’s an integral start to the dinner. 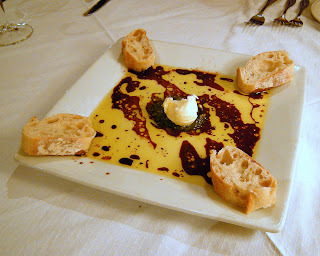 The rustic French-style bread rounds were served up on the corners of a large square plate before us, on the edge of a small sea of mingled balsamic vinegar and olive oil, with a dollop of fresh basil pesto and a crown of fresh butter in the center. Our drinks were refreshed. As we each spread a little pesto on our slices, my husband and I shared a giggle, the sort that you share when you’ve been together for ages and find you’ve discovered something special together. The pesto with its delicate basil flavor balanced well against the slightly sour and springy bread. 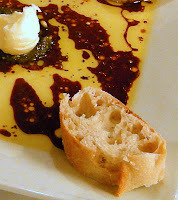 The balsamic vinegar provided a more tangy note to the simple dish. Aaron came back out to talk with us. He asked where else we’d dined in the area, and offered a few recommendations. We weren’t expecting that at all. 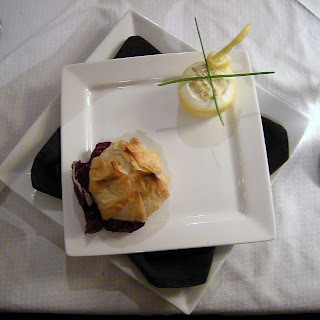 He shared with us that the Crystal Dining Room isn’t competing with most other restaurants. It’s a unique experience that’s usually savored and kept for special occasions such as weddings, anniversaries and the like. The length of service and the prices put it in a different category and class of eatery. We agreed that so far, our experience had been unparalleled in town. Out came the next course, soup and salad. 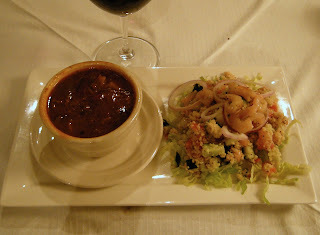 My husband had chosen the soup of the day, Vegetable Beef, and the Couscous Salad with Shrimp. The meaty broth of the soup was very rich, full of chunks of vegetables and tomato. The salad, tomatoes and cucumbers and green bell peppers and olives and onions tossed with Couscous and topped with delicate baby shrimp, had a unique mouthfeel and texture. The little pink shrimp, cooked perfectly, perched on the salad and shimmered with a bit of the Oregano Garlic Vinaigrette specially prepared for the dish. He told me he could have just eaten the salad and soup and been happy with the meal. 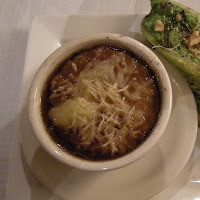 I’d chosen the house soup, the French Onion Gratin, and was pleased not only with the dark and savory beef and onion broth but also with the softly dissolving crouton beneath the not-overwhelming crown of Gruyere. 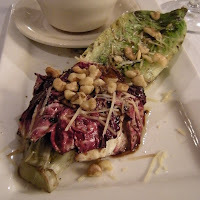 The Bundled Grilled Hearts of Romaine and Radiccio I had chosen as my salad came out warm from their trip over the grill, topped with roasted walnuts and a bit of Parmesan cheese. The sweetness of balsamic vinaigrette met each bite casually -- apparently applied before the grilling. I found myself agreeing with my husband that yes, I could indeed make a meal on that course. Aaron once again joined us and regaled us with stories about dining in the room. He told us about how the wait staff had been trained to provide coordinated service, something that’s become a bit of a lost art around these parts. For a service of eight diners, four waiters can come and bring out the dishes to the diners all at once, in a carefully orchestrated ballet of action, clearing and resetting and presenting each course. That’s something I’d like to see. It may be common in I believe the finest restaurants in the largest cities, but I don’t believe I’ve seen it in my adult life here in Arkansas. The next course arrived. My husband had chosen the Crab Lorenzo, which I had secretly coveted. This dish was the very first entrée ever served here in the Crystal Dining Room, back when it opened in 1886. Of course, it’s a smaller portion, being an appetizer. 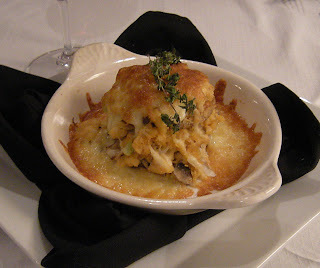 It reminded me of a deconstructed crab cake, with layers of shredded crabmeat, slivers of onion and mushroom, crusty bits and oh my the cheese. He was kind enough to share the dish, and I was thankful. This was certainly the sort of dish that had been bringing people back to the restaurant for more than 120 years. 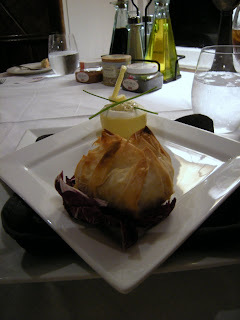 My own choice of appetizer, the Crescent Crab Cake Parcel, was a crab cake within a puff pastry envelope, served up with a remoulade style sauce presented in a hollowed out lemon. 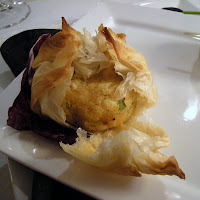 The flaky layers outside concealed a perfect round of crab cake within, meaty and without much filler, savory bliss perfectly accompanied by the sauce. Its presentation was a thing of beauty; pulling open the crust was like pulling apart the petals of a flower. Almost too pretty to eat. We were appreciative of the time in-between courses. It had allowed us to both enjoy our dinner so far and had given us a chance to query Aaron on a variety of subjects. 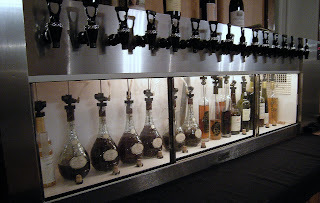 After our appetizer course he showed us the restaurant’s vast wine cellar and its special nitrogen gas wine preservation system, which allowed for several glasses of wine from the same bottle over time to still be as fresh as the first. 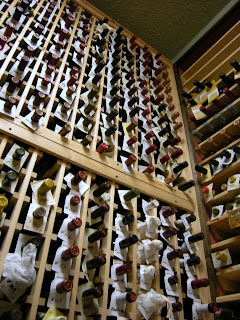 The fine collection of ports and sherries and high-sugar wines were quite tempting. 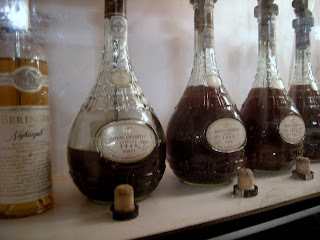 One bottle of port was dated 1944. And then back to our table, and we were introduced to our main courses. 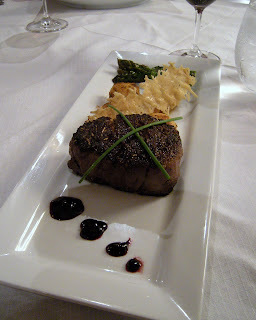 My husband had chosen the Delmonico-Delmonico, a steak apparently so good it was named twice. The massive 16 ounce prime rib can come the traditional way, seared, blackened or served with a Steak Diane-style creamy brandy sauce -- the latter of which he had chosen. Roasted new potatoes and roasted asparagus accompanied the dish, along with a large cheese cracker -- Parmesan cheese baked into a large rectangle that adorned the steak. 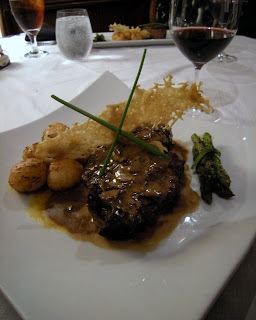 The pliant steak was buttery and delicious. 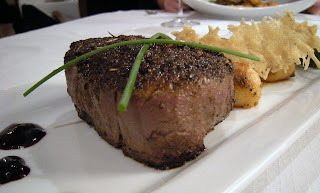 I had chosen the 10 Spice Encrusted Beef Tenderloin Filet, first pan-seared with the spices and then oven baked to doneness. Accompanied by the same sides, the round of steak was fork tender and spiced with far more than the pepper-melange so many restaurants have come to rely on. I couldn’t quite determine all ten spices, but flavors of cardamom and onion were just as prevalent to me as salt and pepper. It was a surprisingly exotic steak. And one, sadly, to which I could not do justice. My husband and I stared at each other across the table, sheepishly admitting the expanse of the three hour meal had defeated us. Outside, the lightning was gone and the clouds were parting, a few stars managing to make it through the dark above. Ah, but dessert! How were we going to manage that? Aaron told us never fear, it was quite normal for the dessert to go home with the diners, considering the amount of food presented over the course of the meal. Cherries Jubilee was out, obviously, but we chose the brownie over the cheesecake for our final course, and one large shareable brownie was packed up for us, along with the remains of our steaks. We did share a final glass of a sweet dessert wine as Aaron wrote down a few wine selections for us to choose to take home with us from our trip. It was a delightful nightcap to the evening. Later that night we’d share that brownie under the stars, still somewhat drowsy from a long and enjoyable dinner. The Crystal Dining Room isn’t for the sort of person who wants to eat and go. Chances are your dinner there will last hours. Bring along a special dining companion or two or three, be prepared to enjoy conversation and wine, and bring a large appetite. 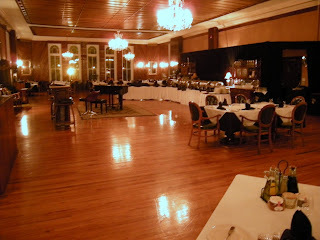 You’ll find the 1886 Crystal Dining Room in the 1886 Crescent Hotel in Eureka Springs. Reservations are suggested. Attire is on the formal side, and romance? Well, you’ll have to provide a suitable companion yourself. Check out the website for the hotel for more information or call (800) 342-9766. We love the Crescent and need to get there more often. We used to stay at Flat Iron Flats whenever we were in Eureaka, but we have not done so in some time since we most often stay in Fayetteville with our daughter when we are in the area. Can't pass up opportunities with the grandbabies:) Your meal descriptiion was outstanding.